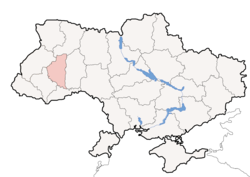 Ternopil Oblast' (Ukrainian: Тернопільська область, translit. Ternopil’s’ka oblast’; an aw referred tae as Ternopilshchyna - Ukrainian: Тернопільщина) is an oblast' (province) o Ukraine. Its admeenistrative center is Ternopil, throu which flows the Seret River, a tributary o the Dnister. The aurie o the oblast is 13,800 km². The Dnister forms the soothren mairch wi the Chernivtsi Oblast. Some o its tributaries flowin throu the oblast are the Zbruch, the Seret an the Strypa Rivers. The Seret River, no tae be ramfeeselt wi the Siret River nor the smawer Seret in Lviv Oblast, is a left tributary o the Dnister flowin throu the oblast caipital, i.e. Ternopil. The Ternopil Oblast is admeenistratively subdividit inte 17 raions (destricts), as well as 1 ceety (municipality) which is directly subordinate tae the oblast govrenment: Ternopil, the admeenistrative centre o the oblast. Raions o the Ternopil Oblast. Wikimedia Commons haes media relatit tae Ternopil Oblast. This page wis last eeditit on 20 Mey 2018, at 09:03.